Guided by her prophetical visions, Keila takes on the oppressive Terran Council. But can the source of her visions be trusted? 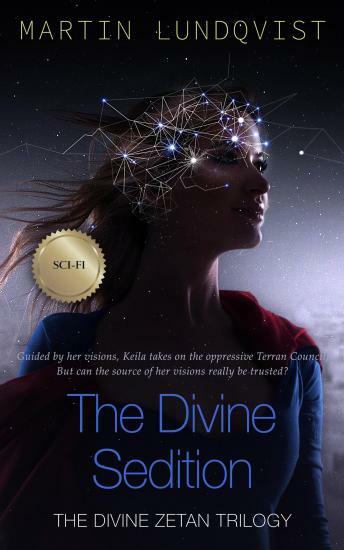 The Divine Sedition takes place in the year 2872 and follows young Martian rebel Keila Eisenstein in her fight against the oppressive Terran Council. In a vision, Keila realizes that to reach her goal to free her people, she first has to liberate the asteroid colony Eden from the tyrant Abraham Goldstein. She succeeds and takes control over Eden. Having gained control over Eden, Keila fakes her own death to fool the Terran Council officer assigned to detain her, Rear Admiral Bjorn Muller. Keila decides to use Eden as her base of operations deceptively turning the Terran Council members against each other. Keila faces overwhelming odds trying to take down the mighty Terran Council that has been dominating the solar system and oppressed the majority of humanity for over 500 years. Keila does, however, have one trump on hand against these overwhelming odds: Her mysterious divine connection. Her visions are leading her way, and with access to the late Abraham Goldstein's technology, Keila can unveil secrets that will help her free humanity from the oppression of the few elite plutocrats dominating all of humankind. But, her connection comes at a price. Thus, are the Zetans, controlling Keila as a puppet, indeed better than the Terran Council oppressors she seeks to replace? A great sci-fi story with relatable and interesting characters and story lines that keeps you listening until the end!